WAIST HIGH: "Under The Milky Way" Voted Best Australian Song Of The Last 20 Years. "Under The Milky Way" Voted Best Australian Song Of The Last 20 Years. The Weekend Australian Magazine has published the results of an online poll to find the best 20 Australian songs since 1988. Readers nominated and voted for their favourites as part of the magazine's 20th anniversary celebrations. 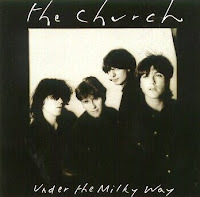 "The track, written by singer Steve Kilbey and his then girlfriend Karin Jansson, made the charts here and in the US and remains The Church's best-known song. Now 'Under the Milky Way' has another credit to its name: it has been voted the best Australian song of the past 20 years." The Weekend Australian "asked readers to nominate and vote for their favourites as part of the magazine's 20th anniversary celebrations. 'Under the Milky Way' was a clear winner, topping the poll from the start of voting since early last month. "Yesterday in Sydney, Kilbey said his song had taken on a life of its own since he began writing it on an old piano at his mother's house on the NSW central coast. 'I just stumbled upon it and for some reason it has struck this wonderful sense of universality with people that most of my songs don't,' Kilbey said. He said that when he first presented the demo version of 'Milky Way' to the band 'no one really liked it that much.'" The song was featured on the album Starfish, "and won the band an ARIA award for best song in 1989. Since then it has appeared on movie soundtracks and has been covered by a broad range of local and overseas artists, including Rick Springfield, Matchbox 20 and Jimmy Little. It also remains a staple of the band's live shows." Kilbey says the song is, "not really about anything at all." He also said, "I reckon (Living in a Land) 'Down Under' would tire me out. But if I had to be saddled with one song that everyone wants me to do, I figure 'Milky Way' is an OK one." Australia also loves Crowded House. The band made it into the top 20 6 times, with "Into Temptation" at #2, "Distant Sun" at #5, "Fall at Your Feet" at #8, "Weather With You" at #12, "Private Universe" at #13, and "Better Be Home Soon" at #16.